Posted on February 15, 2019 | Comments Off on Do You CoQ10? Vital for life and healthy functioning, enzymes are biological molecules, largely proteins, that significantly increase the rate of chemical reactions that take place within cells. Although cells may contain thousands of enzymes, enzymes are highly selective catalysts. Each enzyme has a very specific interaction that determines which of the many possible reactions take place within the cell. Were it not for these enzymatic catalysts, most biochemical reactions would be so slow that they would not occur under the mild temperature and pressure compatible with life. To put this in perspective, enzymes accelerate reaction rates by well over a million-fold. In the absence of enzymes, catalysis that can occur in fractions of seconds would otherwise take years. In general, coenzymes are necessary to support the various biochemical functions of enzymes. Naturally synthesized by the body, coenzyme Q10 (CoQ10) is an important and effective fat-soluble cellular antioxidant that protects cell membranes, mitochondrial DNA and low density lipoproteins (LDL) from oxidative damage. CoQ10 is also known by its reduced form, ubiquinol; aptly named because it is found in virtually all bodily cells and is therefore ubiquitous within the body. It is a crucial participant in the chain of metabolic reactions that generate adenosine triphosphate (ATP), the main source of energy for cellular processes. It stands to reason then that the highest concentrations of CoQ10 are found in high energy organs, including the heart, liver, pancreas, kidneys and adrenals. Tissue concentrations of CoQ10 have been found to gradually decline after age 30. The conversion of CoQ10 to ubiquinol becomes less efficient during mid-life. The body must reduce CoQ10 to ubiquinol in order to be used for cellular energy production, necessary for optimal organ and bodily functions. Decreased plasma concentrations have been observed in individuals with diabetes, cancer and congestive heart failure. Those who are taking lipid lowering medications, or statins, are at a particular risk for deficiency because statins inhibit activity of an enzyme critical to CoQ10 biosynthesis, and thereby decrease circulating CoQ10. For people on statin therapy, a low level of CoQ10 can contribute to statin-related side effects, such as fatigue, joint aches and muscle cramps. As CoQ10 is found in high concentration in heart muscle cells, deficiency is associated with cardiovascular problems, including angina, arrhythmia, heart failure and high blood pressure. Problems with blood sugar regulation, periodontal health and stomach ulcers have also been associated with CoQ10 deficiency. CoQ10 or ubiquinol supplementation may be especially helpful for any adult taking statin medications, those with a family history of heart disease and individuals at risk for cardiovascular disease. Although more studies are needed, CoQ10 supplementation shows promise as an inhibitor of lipoprotein oxidation in blood vessel walls and the formation of atherosclerosis. For otherwise healthy individuals, CoQ10 taken as a preventive measure may help maintain a healthy cardiovascular system. Studies show that supplementation may significantly increase good HDL cholesterol even among those taking statins. As well, supplementation may lower levels of inflammatory biomarkers shown to be risk factors for cardiovascular and chronic diseases. The heart requires a significant amount of cellular energy for both contraction and relaxation of the heart muscle. Lacking CoQ10 to produce ATP, heart function would be compromised. 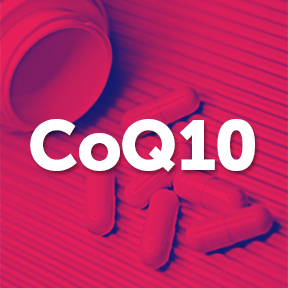 CoQ10 has an excellent safety profile with no reports of significant adverse side effects. Individuals taking anticoagulant medications should consult a healthcare practitioner before taking CoQ10, as it may decrease the medication’s effectiveness. Small amounts of CoQ10 may be obtained by foods found in a healthy diet, such as chicken, meat, fish, whole grains, olive oil and cruciferous vegetables. As CoQ10 is fat-soluble, supplements should be taken with a meal containing fat for best absorption. Individuals over 40 years of age should consider the advantages of supplementing with the ubiquinol form of CoQ10, as it requires no further conversion by the body to be utilized. Adequate CoQ10 levels support the cellular energy the body needs to maintain overall health and wellbeing. Energy production associated with ubiquinol benefits whole body health by providing the cellular energy necessary for the heart and other organs to function at optimal levels. Ubiquinol-QH 100 mg by Pure Encapsulations®: This hypoallergenic formula supplies ubiquinol, the active, readily-absorbable antioxidant form of CoQ10 in support of cellular energy production, antioxidant protection and cardiovascular health. Gluten free, Non-GMO formulation. Ubiquinol-QH by Douglas Laboratories®: Each softgel supplies 100 mg of CoQ10 as ubiquinol in support of cardiovascular health and function. Free of yeast, wheat gluten, soy protein, milk/dairy, corn, sodium, sugar, starch and artificial coloring, preservatives and flavoring. UBQH™ Ubiquinol 100 mg by Integrative Therapeutics®: UBQH™ supplies the reduced active-from of CoQ10 in support of cellular energy production and overall wellness. Free of gluten, wheat, dairy, corn, sugar, yeast, salt and artificial flavoring and coloring. Ubiquinol 100 mg by Protocol for Life Balance®: This highly bioavailable, naturally fermented Kaneka Ubiquinol™ is formulated to support normal cardiovascular and neuronal functions. Free of gluten, wheat, soy, milk, egg, fish and shellfish. Comments Off on Do You CoQ10?